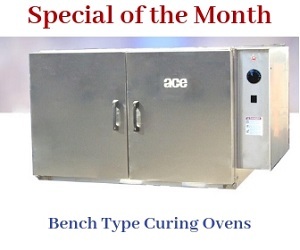 The ACE Model 31000-RT burn off oven has the capability to heat clean parts or components, which are heavily coated with grease, oil, dirt, and dust. It is a user-friendly pyrolysis system, suitable for cleaning parts of different shapes, and medium to large sizes. This user simply needs to load the items into the oven, set the requisite parameters, and turn the oven ‘on’. The rest of the operation will be taken care of by the oven. Volume Over Cart 1440 CU. FT. Exhaust Stack I.D. (2) 18"
Exhaust Stack O.D. (2) 22"
Top Mount Pressure Relief Hatches(4) 110.4 SQ. FT.
4 Natural Gas Inlet Pressure 8" to 14" W.C.
6 Gas Inlet Pipe Size 3"
The oven is designed keeping the operator’s safety and comfort in mind. The standard design of the model 31000-RT adheres to UL and ISO certifications. If required the oven can also be designed to adhere to regulations laid down in FM and NFPA–86A.